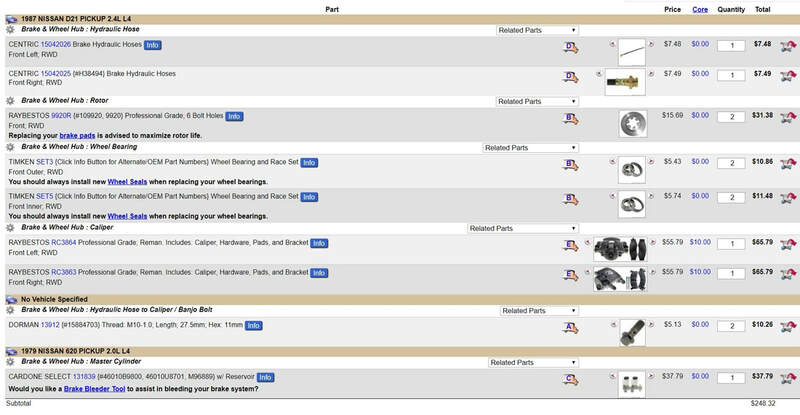 Just in case the rest of the info is a bit confusing, here is a snap shot of a Rockauto.com shopping cart with the parts listed. These are sample parts. We are not recommending one brand over another, or even Rockauto for that matter. You can use these part numbers for cross reference elsewhere online or at your local parts store. The bearings are not required unless you are buying new Hardbody hubs or replacing the old ones that came with your donor parts. The master cylinder is highly recommended!!! There is more info at the bottom of the INSTALLATION PAGE. If you can pull known good parts, that's the easiest and cheapest way to do this swap. There are several ways to mix-n-match parts from donor vehicles which might help guys that don't have access to a variety of trucks. I'll break out each part into their own section to help keep things a bit clearer. Click on each of the highlighted words at the beginning of the paragraphs for more info. Hubs:(click for more info) The best donor option is a 11/82 - 10/85 Datsun 720 2wd pickup. You can also use the hubs from the disc equipped 620 and the 2wd D21 Hardbody(HB) Nissan pickup. The hubs from the 720's after 10/85 may require the same larger center hole on the rims that the HB's hubs require. The centering nubs of these rims can be machined down to fit the smaller center hole of the 320-620 rims, but that adds to the cost of your installation. You can leave the hubs alone if they fit your rims, but keep in mind that if you change rims later, you will most likely need to have the hubs machined at that point. Easier to do it prior to installation. Don't forget to check your spare tire to make sure it fits. The machine work is only required on the late 720 and HB hubs. The 620 hubs require no machine work. Make sure you get the 6 bolts that hold the rotor onto the backside of the hub! The rotors are very specific. They must be from the 11/82-10/85 Datsun 720 pickup. If buying new rotors, tell the parts store you need '84 720 2wd front rotors. If your donor vehicle fits this criteria and rotors are in good condition, you can reuse them, but I recommend getting new ones. Keep in mind when pulling parts from the scrapyard, by the time you pay for the used rotor and the resurfacing, it will be within a few dollars of simply buying a new rotor. Calipers:(click for more info) The calipers from the 11/82 720 through the HB models up into the '90's use the same caliper. If ordering new calipers, order for an '87 D21(Hardbody) 2wd. New or used, make sure that you get the mounting brackets with the caliper. This is typically more of a concern when ordering new calipers since they tend to come without, unless you specify that you need them. The reason for specifying the '87 is because they may come with banjo bolt....see note below about the banjo bolts. Here are some Raybestos part numbers for cross reference. My reference didn't state whether or not it has a banjo bolt. Banjo Bolts:(click for more info) If you buy new calipers, you may not get banjo bolts with them. If you do not, then order your hoses for a '87 Nissan D21 Hardbody since the bolts at the dealer are much cheaper than the 720 bolts. Hoses:(click for more info) The brake hoses used with this installation have metric threads. You will need to either flare a new brake line nut onto the end of the stock hardline, or use an adapter like the Brake Quip BQ49. The 620 already has metric nuts on the hard lines. The body mounting tab for the hose does not match the profile of the hose fitting. It seems to hold just fine by mounting it to the tab the same way it did on the donor vehicle using the horseshoe clip. If you're not comfortable with mounting it this way, you'll have to figure something out. On the caliper end of the hose, there is a thickness difference depending on the year. If you bought used calipers WITH the banjo bolts, but are buying new hoses, order the hoses to match the same year/model as your calipers. If you're ordering new hoses, order 1987 D21 Hardbody hoses so that you can use the cheaper banjo bolt. Bearings: You can reuse the bearings that come with your hub. I would highly recommend cleaning and repacking them. If you're not sure how to judge the condition of the used bearings, consult a professional mechanic or simply buy new ones. Now would be the best time to replace them if you have any reservations about the condition of the used ones. These are very common bearings and should be available at any of your local auto parts stores. These bearings are used in Datsun, Nissan, Toyota, Dodge, Mazda and several other makes of vehicles. Seals: New seals come with the kit. These seals fit a '79 Datsun 620 if you need to replace them in the future. Master cylinder(m/c): 320/520/521 It is highly recommend that you upgrade m/c to a dual reservoir unit like the ones found in the later models. The '78 280z m/c(7/8" bore) and the '79 620 m/c(13/16" bore) have both been used. Minor modifications to the m/c mounting holes and the opening in the firewall are req'd. Both of these m/c's are metric and will require adapters, new lines, or new metric flare nuts to be used. The truck will stop with the original m/c, but since it is a single circuit, it will tend to lock up the rear brakes under heavy braking in dry conditions and even moderate braking in wet conditions. Master cylinder(m/c): 620 These modifications should not be required when upgrading a 620, since it already has a dual reservoir m/c. You should upgrade the m/c to one of the disc/drum versions listed, but it should install without any modifications.